One of the issues that many open-source developers and companies struggle with is funding. There is an assumption, an expectation even, among the community that Free and Open Source Software must be provided free of cost. But even FOSS needs funding for continued development. How can we keep expecting better quality software if we don’t create systems that enable continued development? We already wrote an article about open source funding platforms out there that try to tackle this shortcoming, as of this July there is a new contender in the market that aims to help fill this gap: IssueHunt. 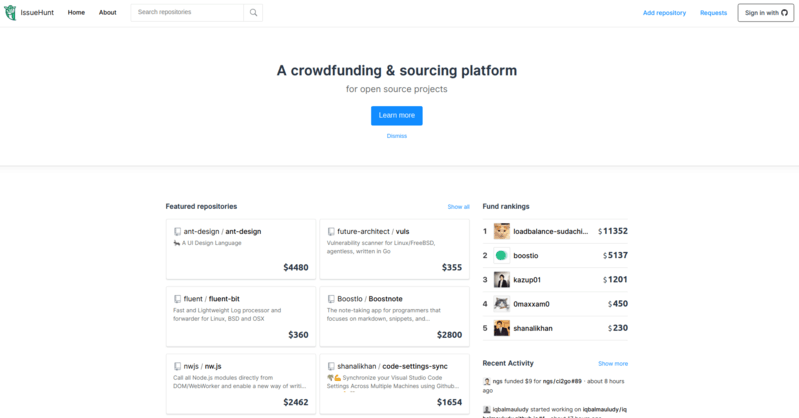 IssueHunt offers a service that pays freelance developers for contributing to open-source code. It does so through what are called bounties: financial rewards granted to whoever solves a given problem. The funding for these bounties comes from anyone who is willing to donate to have any given bug fixed or feature added. If there is a problem with a piece of open-source software that you want fixed, you can offer up a reward amount of your choosing to whoever fixes it. Do you want your own product snapped? Offer a bounty on IssueHunt to whoever snaps it. It’s as simple as that. And if you are a programmer, you can browse through open issues. Fix the issue (if you could), submit a pull request on the GitHub repository and if your pull request is merged, you get the money. The product came to be when the developers behind the note-taking app Boostnote reached out to the community for contributions to their own product. In the first two years of utilizing IssueHunt, Boostnote received over 8,400 Github stars through hundreds contributors and overwhelming donations. The product was so successful that the team decided to open it up to the rest of the community. Today, a list of projects utilize this service, offering thousands of dollars in bounties among them. Boostnote boasts $2,800 in total bounties, while Settings Sync, previously known as Visual Studio Code Settings Sync, offers more than $1,600 in bounties. There are other services that provide something similar to what IssueHunt is offering here. Perhaps the most notable is Bountysource, which offers a similar bounty service to IssueHunt, while also offering subscription payment processing similar to Librepay. 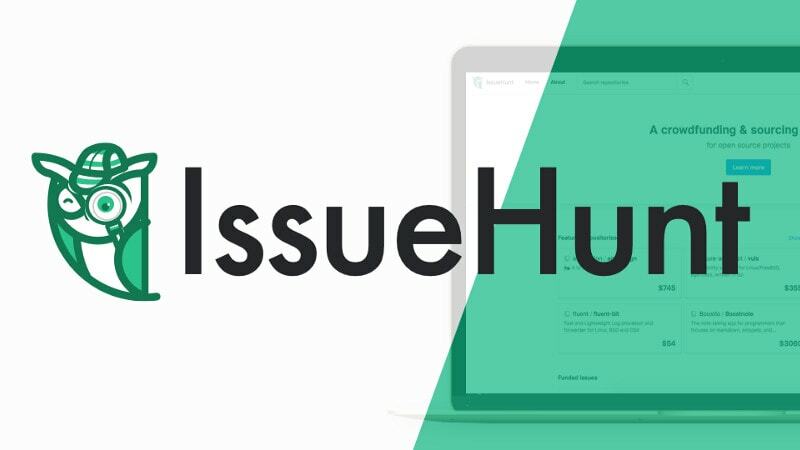 What do you think of IssueHunt? At the time of writing this article, IssueHunt is in its infancy, but I am incredibly excited to see where this project ends up in the comings years. I don’t know about you, but I am more than happy paying for FOSS. If the product is high quality and adds value to my life, then I will happily pay the developer the product. Especially since FOSS developers are creating products that respect my freedom in the process. That being said, I will definitely keep my eye on IssueHunt moving forward for ways I can support the community either with my own money or by spreading the word where contribution is needed. But what do you think? Do you agree with me, or do you think software should be Gratis free, and that contributions should be made on a volunteer basis? Let us know what you think in the comments below. The problem is that open source projects need funding, and your solution is to have the project pay developers to work on it? The goal should be to get developers to DONATE their time. I have several open source projects. I spend a LOT of time on them and offer them for free. I can tell you for certain the last thing I want to do is to PAY other people to work on them. I gladly accept help, but it’s always on a donation basis. I most certainly don’t have the money to pay people to work on them. Maybe this sounds good from the point of view of a developer who’s contributing but isn’t an owner, but as an owner this sounds like solving the wrong problem. > submit a pull request on the GitHub repository and if your pull request is merged, you get the money. This sounds cool, but also potentially damaging. From my experience as a maintainer, there is a lot of time spent by myself and others reviewing and discussing changes; merging, testing, etc. This is a necessary effort to foster a wide contributor base. * Maintainers just start making their own pull requests and merging them, ignoring contributers to readdress the balance. Not saying that this *will* happen, but it would be interesting to see if **shared** effort on issue resolution will be taken into account, and not all the $$$ just going to lone devs making pull requests.